When we stand next to King mountain, we have to ask…what forces created this behemoth thermal generator that stands one mile above the Big Lost River Valley? King Mountain and the Lost River Range are in the Colombian Plateau of the Northern Rocky Mountains. Water, fire and ice have shaped the area over millions of years. Only in the last little blink of a geologic eye has man been able to soar above this mountain with the Hawks and the Golden Eagles. Many of the rocks in the area and on King Mountain contain fossils of ancient sea creatures. It is common to find these just above Lower Launch and indicates that at one time King Mountain was beneath the sea. About 15 million years ago a large meteor struck in the area which is now eastern Oregon, northern Nevada, and southern Idaho. This object penetrated deep into the earths crust forming the Super Volcano which is now beneath Yellowstone. Here is a map which shows the location of the Caldera over time. Each figure represents the location of the hotspot in millions of past years under what is now the Snake River Plain. As the plate tectonic has moved southwestward over the top of the Caldera, the earths crust eventually heats and explodes, showering riolite or molten granite all across the region. For years afterward, and with a thousand times the energy of Mt. St Helens, the Super Volcano spews ash which can lay 50 foot thick on the Midwest of the United states. 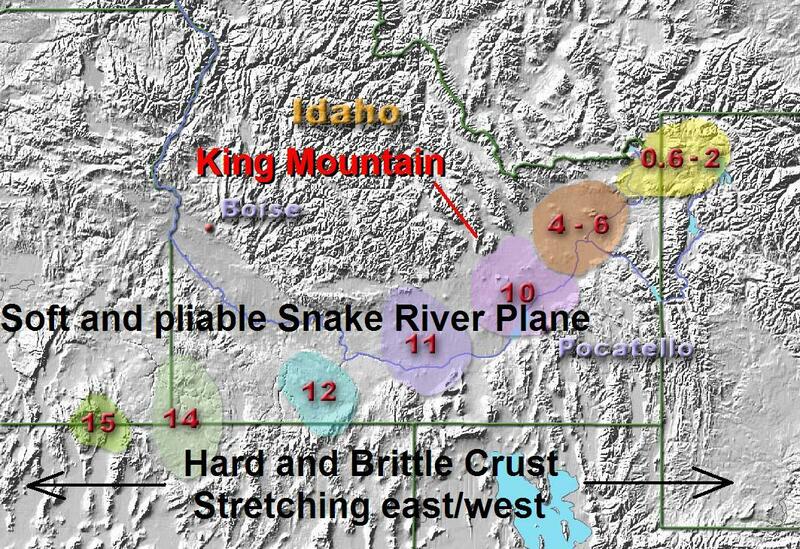 After venting, with the heat and pressure now relieved, the earths crust collapses and forms another segment into the Snake River Plain. This cycle has been repeated about every 600 thousand years for the last 15 million years. The western United States is slowly being stretched from east to west about 1 inch per year. Salt Lake City used to be twice as close to Reno, Nevada as it is today. Brittle rock does not stretch without breaking. When these fractures occur, the mountains rise upward because they are more buoyant upon the molten magma, and the valleys fall downward. This is what creates the range and basin formations so common in California, Nevada, Utah, Idaho, and Wyoming. 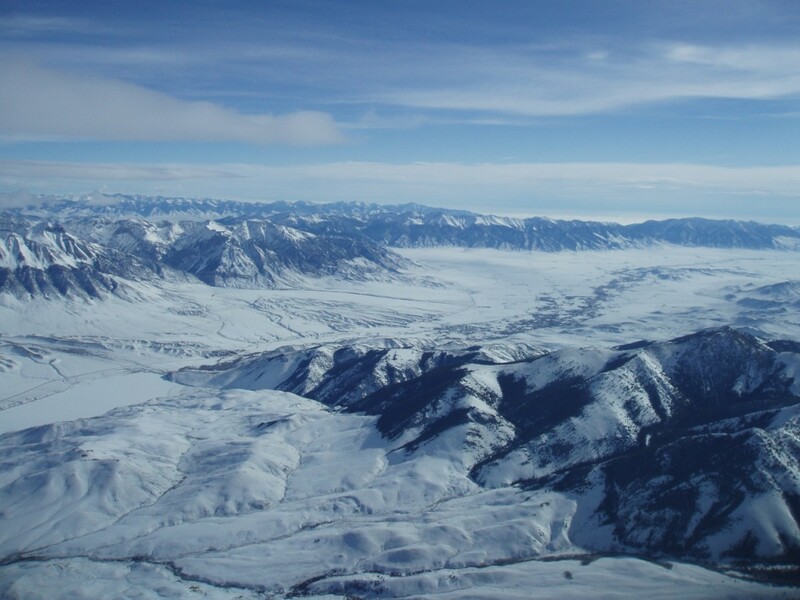 Because the area beneath the Snake River Plain is relatively hot, soft, and pliable, due to the Yellowstone caldera, few earthquakes occur in the plain itself. Like taffy, it stretches easily. The ancient seabed located north and south of the plain are very brittle and the rock will not stretch easily. As the earths crust stretches apart, the mountains on each side of the plain fracture and break. When they do this, the mountains thrust upward and the valley falls away. This range and basin effect has also created King Mountain. When these fractures or seismic faults occur great energy is released in the form of massive earthquakes. 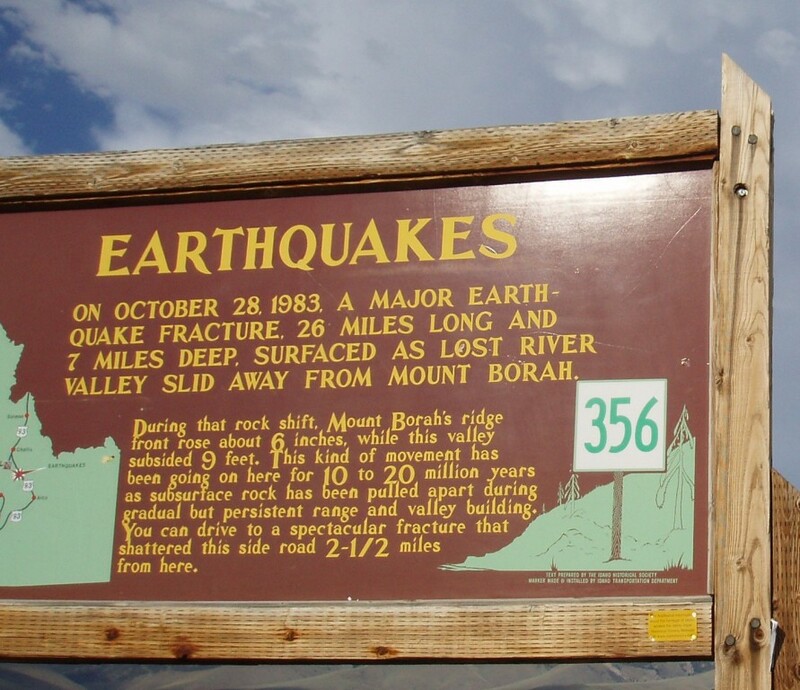 One such earthquake in the late 1950’s created Hebgen Lake in West Yellowstone when an entire mountainside fell into a valley below damming a stream. A number of people were killed. In 1983, two children perished in Challis, Idaho when a giant boulder rolled into their house during an earthquake that occurred when Mt. Borah thrust upward 9 inches and the valley floor in the Thousand Springs Area, just upstream of Mackay Reservoir, fell 9 feet. Underground water in the aquafier literally exploded into the sky when the valley fell. 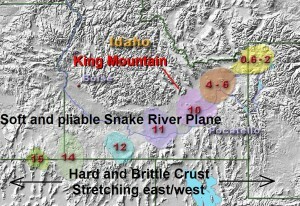 Our last earthquake in the range and basin occurred south of the Snake River Plain in 2008 in Wells Nevada. Many building were destroyed but there was no loss of life. Just as with Jackson Hole and the Grand Tetons, these are the forces which have created King Mountain and the Big Lost River Valley. 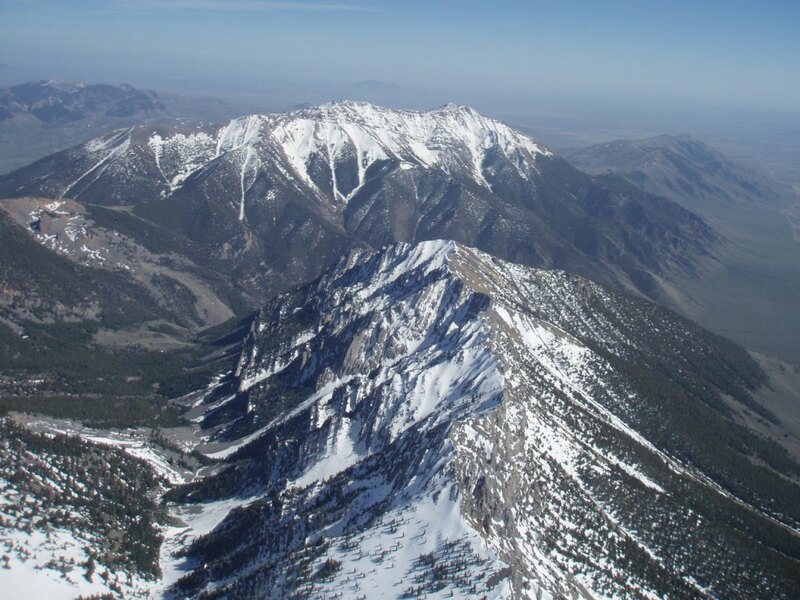 King Mountain is in a very active seismic area of the United States. Geologic studies indicate that King Mountain experiences a major seismic event once every 100 thousand years. Geologic history has left a record of movement of 6 feet between the valley floor and King Mountain. Opposing this building action is the process of erosion from wind, rain, snow, and ice which moves rock from the mountains and flows it into the valleys over time. The alluvial deposits at the base of King Mountain and the thousands of feet of sand and gravels in the valley floor are all the result of this erosion. At one time, all of the gravel in the park roads was either part of the mountains in the area, or ejected from the Yellowstone Super Volcano. The Big Lost River has meandered over time moving material down from the Mountains and the upper reaches of the valley. The total area encompasses over one thousand square miles. This material mostly sand and gravels used to be part of the mountains. In addition, some of the material used to be beneath a “Super Volcano” which today lightly sleeps beneath Yellowstone National Park. Comprised of both eroded and ejected material, the Big Lost River Valley gently flows and slopes downward from Mackay in the north, towards Arco and the Snake River Plain to the South. Eventually the river flows the “Sinks” area east of Howe. The water then seeps beneath the surface and flows underground across the Snake River Plain to emerge a hundred miles southwest of us near Hagerman, Idaho. Now we know why they call it the Big Lost River! The Big Lost River Valley passes in front of King Mountain, and slope at about twenty five feet per mile or one half a percent grade. It is this gentle slope that creates the day and night breezes we experience at the glider park. It is this same gentle slope that allows us to tow downhill and into the day wind on almost every afternoon. The north end of the runway is seventeen feet higher than the south end. Down hill and into the wind…perfect Geology and Weather combined. As the Glider Park is situated just east of the river bottom, the valley floor has already began to slope upward towards the visible base of king Mountain. Glider pilots will recognized this location as a thermal trip zone. Ever so gently at first, the valley slopes almost imperceptibly, and upward past the Glider Park towards King Mountain. So powerful is this event, on one day in October we observed eight dust devils at one time in the Park. A quarter of a mile east of the Glider Park, the valley floor meets the alluvial deposit which lies at the base of King Mountain. Here, just below Hill road at the irrigation Canal, the slope increases very noticeably and there is an even greater probability of tripping powerful valley thermals. When the alluvial meets the bottom of the mountain range we are very close to the fault zone where the mountain breaks from the valley. The Big Lost River Range rises dramatically and reveals the upthrust sea bed which forms the cliffs and ridge patterns visible all the way up the Big Lost River Range. Gravity, Ice, wind and water slowly remove this upthrust material and send it down avalanche chute and smoothly flowing scree fields to the alluvial fans and the valley below. This is the geologic tapestry that we enjoy and the shapes that combined with the wind and the sun create the tremendous lift that we soar in. 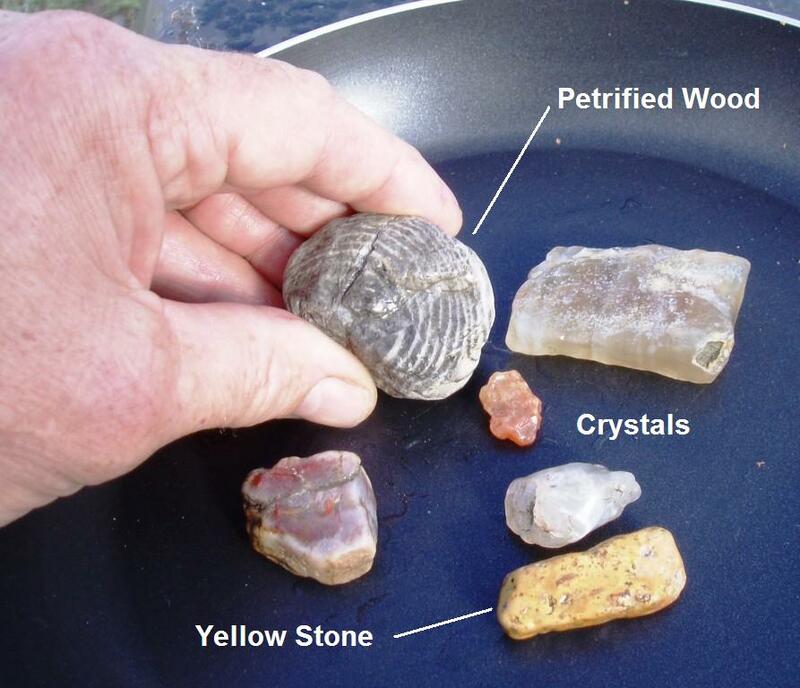 When walking on our roads in the park, we can observe Volcanic Yellowstone rocks, ancient sea bed, and even petrified wood. If you find a neat rock at the King Mountain Glider Park, you are always welcome to take it home with you. Share the treasure with your friends… and just imagine the wind, fire, and the ice that might have created it…and King Mountain! This part of east-central Idaho and southwest Montana is made of Precambrian and Paleozoic rocks that were shortened by folding and faulting and thrust northeastward during the late Mesozoic. Later extension broke the thrust complex into northwest-trending basins and ranges and continues today. The Lost River fault is a high-angle, down-to-southwest, range-front normal fault, with a minor sinistral component. The fault bounds the southwest side of the Lost River Range and separates the range from Round Valley, Antelope Flat, Thousand Springs Valley, Barton Flat, and the Big Lost River. 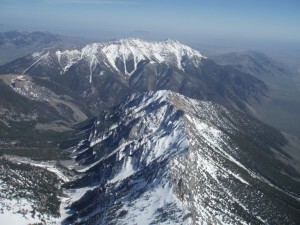 In its north-central portion, the Lost River fault is joined from the west by the much shorter, northeast-dipping Lone Pine fault . The two normal faults bound an intervening graben. The much greater length and larger topographic relief of the Lost River fault indicate that it is probably the master fault, and that the Lone Pine fault probably terminates against it at depth. Hypocentral locations and focal mechanisms of earthquakes in 1983 and 1984 and their numerous aftershocks support this suggestion (Doser and Smith, 1985 #276; Jackson, 1994 #833). There may be as much as 6.1 km of late Cenozoic displacement across the Lost River fault (Skipp and Hait, 1977 #78).